(3.9m x 2.8m) Double glazed windows. (2.8m x 2.4m) Double glazed window. (3.6m x 1.8m) Double glazed window. Stainless steel sink unit. Integrated gas hob. Integrated electric oven. Washing machine.Fridge. Radiator. Kitchen wall and base cupboard. White panelled bath with shower screen – white wash hand – button flush w.c.. Double glazed window. Band ‘C’ – Current rating 75. Minimum 12 month Assured Shorthold Tenancy. Furnished. Check in inventory fee £120.00 including VAT. Before the start of the tenancy the tenant will be expected to pay one month’s rent in advance and a deposit equivalent to 6 weeks rent as a holding deposit. 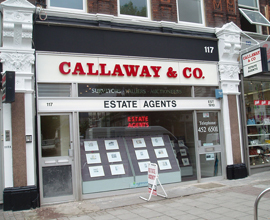 Callaway & Co., will require a holding deposit of one week’s rent to reserve the property – this payment will form part of the initial rental payment and is not an additional payment should the tenancy proceed.